Can a 'one-trick' software firm survive in era of converged engorgement? Why is DataCore the only dedicated software SAN virtualisation appliance vendor left standing? The answer lies in a skewed revenue geographic model, staff majority ownership of the company and a fair amount of luck. It's also down to a solid product, though other companies with great products have failed where DataCore did not. DataCore has absorbed $100m worth of funding and developed nine generations of storage virtualisation software – which it calls storage hypervisors – while other software storage virtualisation developers have withered and died in the face of storage array and server vendor selling their own storage virtualisation software paired with hardware; IBM's SAN Volume Controller (SVC) for example. How has DataCore managed to prosper - it has prospered - and survive in the face of such competition? The answer lies in the unique nature of the company and its founders. DataCore was founded in 1998 with the realisation that a SAN disk drive array was, or could be, an X86 server running drive array controller code, using its attached storage and presenting as virtual disks of networked, block-access storage. Customers could buy standard servers, provision them with commodity disk drives, and so have freedom of choice rather than being restricted to storage array manufacturers' disk drive prices, often quite high, software licensing and functionality. They can also buy external storage arrays and have DataCore's SANsymphony software control them too. Thus DataCore helped pioneer the SAN virtualisation appliance idea. SANsymphony, a storage hypervisor as DataCore views it, and its associated products support a variety of server operating systems and hypervisors, and provide modern SAN array features such as virtualisation, high-availability and thin provisioning. It can run in a dedicated server or as a virtual machine and there are more than 6,000 DataCore customers with more than 20,000 software licenses bought. However, in this era of customers increasingly wanting simplified purchase and operation, what are the prospects for suppliers like DataCore that offer a single component of a system? Converged server/storage/network systems are being produced on the one hand, and cloud storage services being offered on the other, while flash-enhanced servers are offering faster-than disk storage IO – in this case storage array controller software. Will end users continue to buy DataCore's storage controller-only software in the face of simpler all-in-one converged systems, as an alternative to remotely-accessed storage "in the cloud" with no need for on-premise storage arrays, and as a way of delivering data over the network when servers with flash storage get it much faster? Storage and server vendors are introducing Virtual Storage Arrays (VSAs), storage array controller software running in a server and using disks connected to that server as a SAN resource. This is the core of what DataCore is doing and so a new avenue of competition is opening up. Storage array vendors are also introducing flash caches in connected servers that cache hot data from their SAN arrays and so provide faster data access. EMC's VFCache is typical of his approach. What are DataCore's responses to these challenges? 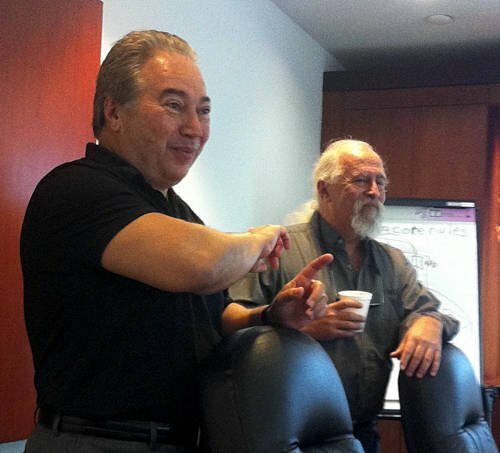 At a press briefing in DataCore's Fort Lauderdale HQ we heard about DataCore's situation, strategy and prospects from CEO and founder George Teixeira and chairman Ziya Aral. The DataCore story starts with Massachusetts-based Encore Computer Corporation, a pioneer of parallel processing systems along with Pyramid and Sequent. George Teixeira was VP and general manager of the product business unit and Ziya Aral its VP for engineering and the chief technical officer. Encore bought the Fort Lauderdale-based Systems Engineeing Labs from Gould in 1989, with its line of 32-bit computer-based products and control systems for NASA. It then built Infinity-90 storage devices for Unix, Windows and mainframe computers, using a reflective memory design that enabled SAN (Storage Area Network) functionality; the storage device could be shared by accessing servers. Encore's storage products group was sold to Sun Microsystems in 1997 for $185 million, with some 200 employees going with it, and Sun sold the storage product as the A7000. It didn't last long and was dropped. After Sun bought the storage products group both Teixeira and Aral left, with Teixeira founding DataCore in Fort Lauderdale, Florida, in February 1998. The great problem for us has always been the US. [I] think we're seeing headway. Aral joined as chairman and other Encore-era colleagues of the two joined in as well, a dozen in all. They worked with no pay until the January 1999 infusion of nearly $8 million angel investment and venture capital funding. DataCore built on the Infinity-90 idea but, having been burnt by HW vendors dropping products, they decided to make a software SAN product that wasn't dependent on HW vendors and their components. Luckily they picked the X86 processor environment and have ridden the rising power curve of that most successful of all microprocessor products ever since. The first SANSymphony product was released in 2000 and it's been successively revised, extended, and developed ever since. Teixeira noted elsewhere that in earlier years "IBM resold DataCore, Hitachi invested and did an OEM deal with DataCore years back and we did OEM deals with NEC and Fujitsu. IBM and Hitachi now have their own storage virtualisation products". Fujitsu also invested in DataCore, like Hitachi, with both wanting to learn about thin provisioning. IBM resold DataCore SW to learn about storage virtualisation according to Teixeira.